The Samsung Galaxy S Plus android phone is nowÂ availableÂ for purchase from Vodafone for free on a Â£31 per month contract. The Galaxy S Plus is essentially a Galaxy S phone with an updated CPU. The shell is literally the same as its predecessor. I'm not sure who exactly VodafoneÂ thinksÂ will get a contract with this phone for such a high price. 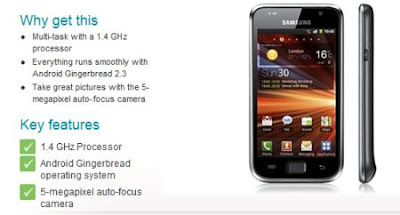 Especially when phones such as the LG Optimus 2X areÂ availableÂ cheaper, but with much better specs... One of the more positive aspects is the phone comes with gingerbread (although that might be out of date soon anyway! ).